We can’t remember when the fascination with bending high-end technology products in half started, but we’re ready for it to end. That, unfortunately, isn’t going to happen in time for one poor iPad Pro, after YouTuber JerryRigEverything decided it would make for plenty of views if he took an iPad Pro and bent it in half. The full video includes the taking apart of a second generation Apple Pencil as well as the inscribing of a Spider-Man face in the anodization on the back of the iPad Pro, a sign that the anodization is perhaps not as thick as it could be. 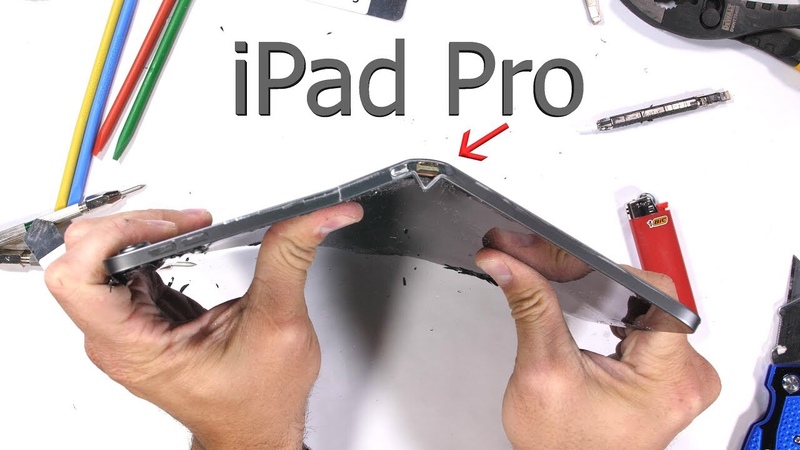 The same goes for the sapphire used to protect the iPad Pro camera, with the Youtuber able to scratch it relatively easily considering Apple’s claims that it should be nice and tough thanks to all that sapphire. The suspicion is that the sapphire being used here is not of the purest nature. Regardless, the headline-grabbing feature of the video is the bending of that poor iPad Pro. While some may feel that it should have taken more force to manage, and it’s true the iPad does fold somewhat easily, this is nothing new. Previous generations of iPad have also bent, and that’s likely to remain the case as iPads continue to get larger and thinner. After all, you can’t have light and thin devices with huge surface areas and not expect them to bend. As to whether you think these new iPad Pros bend too easily? That’s something you will have to decide for yourself. Dang it, now I cant put it in my back pocket and sit anymore.. Turns out Apple was first to market once again with the first tablet that can go from tablet to paperweight. News flash, you can break all electronics. Guess I won’t use my razor blade as a stylus now. This was informative. OK Jerry… You win… Here is your 3 inch thick iPad with plenty of solid bezel to really make this a solid, unbendable piece of tech… Happy now? It won’t bend! Now, go make videos about bending other things in half… If you need suggestions I’ve got plenty for ya.